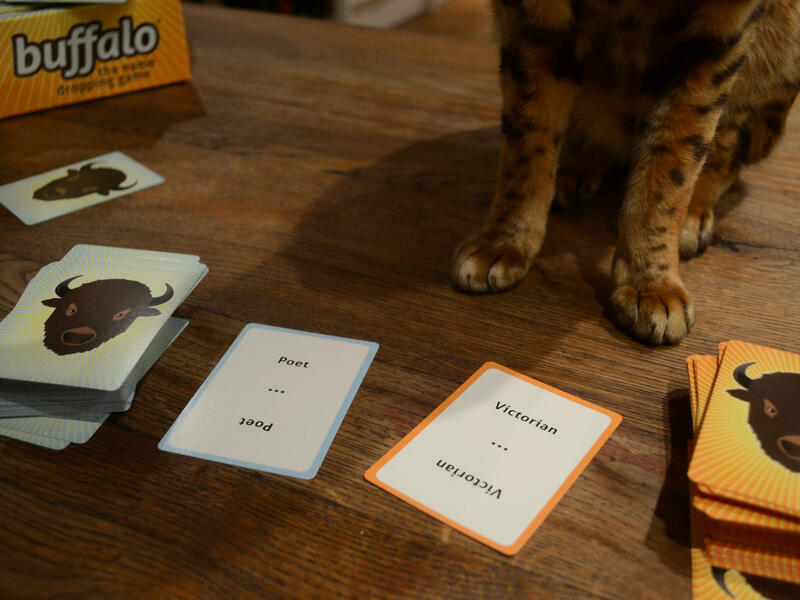 The game Buffalo prompts players to think of people that buck stereotypes, and subliminally challenges those stereotypes in the process. 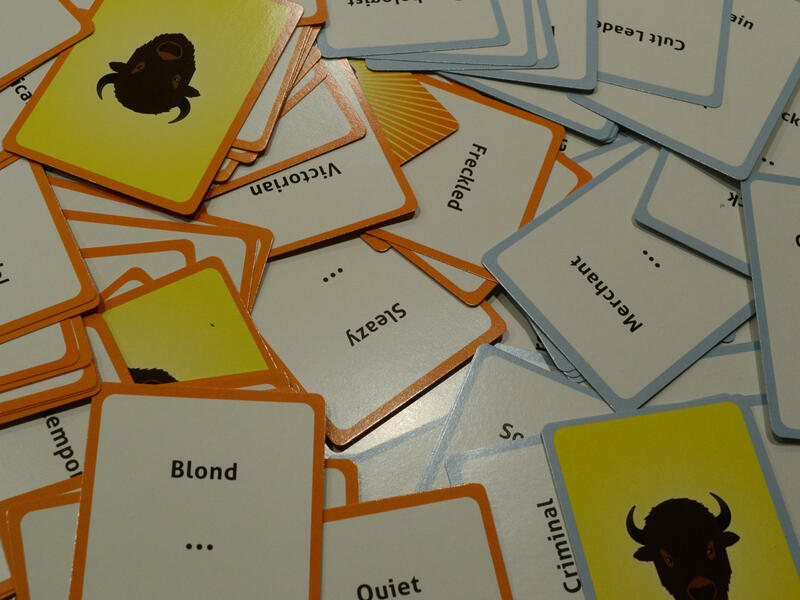 This is where Buffalo — a card game designed by Dartmouth College's Tiltfactor Lab — comes in. The rules are simple. You start with two decks of cards. One deck contains adjectives like Chinese, tall or enigmatic; the other contains nouns like wizard or dancer. Draw one card from each deck, and place them face up. And then all the players race to shout out a real person or fictional character who fits the description. So say you draw "dashing" and "TV show character." 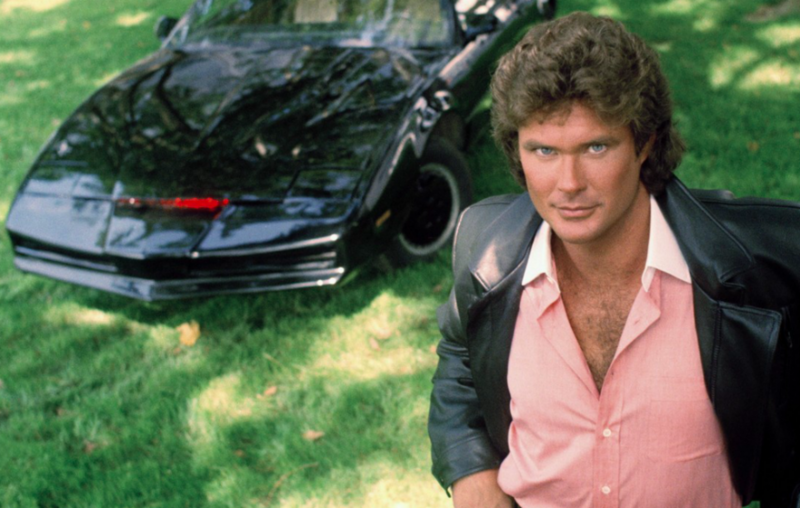 You may yell out "David Hasselhoff in Knight Rider!" Hmm. If everyone is stumped, or "buffaloed," you draw another noun and adjective pair and try again. When the decks run out, the player who has made the most matches wins. It's the sort of game you'd pull out at dinner parties when the conversation lulls. But the game's creators says it's good for something else — reducing prejudice. By forcing players to think of people that buck stereotypes, Buffalo subliminally challenges those stereotypes. "So it starts to work on a conscious level of reminding us that we don't really know a lot of things we might want to know about the world around us," explains Mary Flanagan, who leads Dartmouth College's Tiltfactor Lab, which makes games designed for social change and studies their effects. Buffalo might nudge us to get better acquainted with the work of female physicists, "but it also unconsciously starts to open up stereotypical patterns in the way we think," Flanagan says. In one of many tests she conducted, Flanagan rounded up about 200 college students and assigned half to play Buffalo. After one game, the Buffalo players were slightly more likely than their peers to strongly agree with statements like, "There is potential for good and evil in all of us," and, "I can see myself fitting into many groups." Students who played Buffalo also scored better on a standard psychological test for tolerance. "After 20 minutes of gameplay, you've got some kind of measurable transformation with a player — I think that's pretty incredible," Flanagan says. Buffalo isn't Flanagan's only bias-busting game. Tiltfactor makes two others called "Awkward Moment" and "Awkward Moment At Work." They're designed to reduce gender discrimination at school and in the workplace, respectively. "I'm really weary of saying things like, 'Games are going to save the world,'" Flanagan says. But she adds, "it's a serious question to look at how a little game could try to address a massive, lived social problem that affects so many individuals." Scientists have tried all sorts of quick-fix tactics to train away racism, sexism and homophobia. In one small study, researchers at Oxford University even looked into whether Propranolol, a drug that's normally used to reduce blood pressure, could ease away racist attitudes. Unsurprisingly, it turns out that there is no panacea capable of curing bigotry. There are, however, good reasons to get behind the idea that games or any other sort of entertainment can change the way we think. "People aren't excited about showing up to diversity trainings or listening to people lecture them. People don't generally want to be told what to think," explains Betsy Levy Paluck, a professor of psychology at Princeton University who studies how media can change attitudes and behaviors. "But people like entertainment. So, just on a pragmatic basis, that's one reason to use it to teach." There's a long history of using literature, music and TV shows to encourage social change. In a 2009 study, Paluck found that radio soap opera helped bridge the divides in post-genocide Rwanda. "We know that various forms of pop-culture and entertainment help reduce prejudice," Paluck says. "In terms of other types of entertainment — there's less research. We're still finding out whether and how something like a game can help." Anthony Greenwald, a psychologist at the University of Washington who has dedicated his career to studying people's deep-seated prejudices, is skeptical. Like Flanagan, he says, several well-intentioned researchers have proved a handful of interventions — including thought exercises, writing assignments and games — can indeed reduce prejudice for a short period of time. But, "these desired effects generally disappear rapidly. Very few studies have looked at the effects even as much as one day later." After all, how can 20 minutes of anything dislodge attitudes that society has pounded into our skulls over a lifetime? Flanagan says her lab is still looking into that question, and hopes to conduct more studies in the future that track long-term effects. "We do know that people play games often. If it really is a good game, people will return to it. They'll play it over and over again," Flanagan says. Her philosophy: maybe a game a day can help us keep at least some of our prejudices away.